Ordering from us couldn't be simpler! The only hard part should be trying to choose from all the products shown! Kindly note you do have to be over 18 to purchase from our website. Please do contact us if you need any help with making your decision. Once you've made up your mind, simply add your items to the basket and confirm the quantity you require. Select your shipping method from the options shown and you can complete payment using Paypal or a credit or debit card. For any items which are to be personalised you will find a "special requirement's" box underneath the product description in which you may enter your wording or message. If there is not enough space, or if you simply prefer, drop us an email with the details instead. If you have any special requests, please just include details on the form and we'll do all we can to accommodate you. If your event is imminent and you need your items in a hurry, please advise us at the point of ordering so we can ensure we meet your deadline. Then you can relax, let us do tour bit and get your order delivered to you in plenty of time for your event! Most of our stock items are despatched within 1-2 working days. In the event of an item being out of stock, we will endeavour to have it with you within 14 days. Where this is not possible, we will contact you to advise you of this. If you are on a tight deadline and need your item in a hurry, please e-mail us to verify the delivery timeframe and we'll do our best to help. Please bear in mind that personalised items will take a little longer. Help! I Need My Goods NOW! First of all don't panic! We'll always help out where we possibly can. Contact us straight away and we'll help you select the right products and arrange an express courier for you. 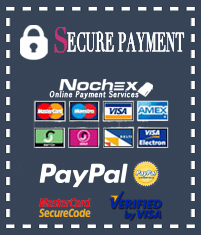 Credit and debit cards payments are processed using Nochex which use the highest commercially available security. You can also pay with Paypal. Don't worry if you haven't got an account, if you wish to pay by credit or debit card, simply select this option and follow the on screen instructions. Both methods provide a 24 hour secure server thus ensuring all your payment information is encrypted and protected. 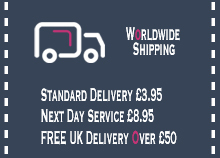 Due to the wide variation in products we supply, we will select the best means of delivery for your particular order. This will typically be Hermes, Royal Mail or a next working day courier. On delivery of our personalised alcohol products, the driver will require ID to confirm you are over 18. The Pink Pear welcomes international orders. Once you have chosen the items you wish to purchase, you can contact us for an exact shipping cost. We'll calculate this for you based on weight & destination. We are not responsible for any duties or taxes associated with your shipment. Any applicable taxes, surcharges, VAT fees, import duty or brokerage charges on imported goods must be paid for by the customer. If you have questions regarding this, please contact your local taxation department. What are your Postal (Shipping) Charges? We operate a flat rate charge of £3.95 including VAT for all UK mainland orders. This has the benefit of speeding up order processing (especially during peak periods) and you never need to worry about how much your postage will be because it will always be the same no matter how large or heavy your order is! The charge is worked out as an "actual cost" of what it costs us to send out all orders and covers our basic expenses including VAT and is still, we believe, a very reasonable charge. For customers who wish to place smaller orders, we recommend that you group your smaller orders together to make the most of the flat rate charge. If you feel unsure in any way about your postal charge, please do get in touch and we'll work out a cost based on your exact order. We pride ourselves on taking personal care of your orders to ensure your shopping experience with us is honest, friendly and above all, that you have a great time and come back again! We want you to feel confident about shopping with The Pink Pear and to be totally satisfied with your purchase. If you have a problem we want to help resolve that for you. All of our products come with a 14 day no quibble guarantee, with the exception of personalised and perishable items. To keep our customers satisfied, returns are a simple and easy process. If you have a query or a problem with your order, please notify us as soon as possible and we will advise you how to proceed. If the item is either faulty or damaged please contact us and we will arrange for a replacement or refund. If after receiving your order you are not satisfied with the product, simply email us within 14 days to request a return authorisation (RA) number and return the item for a refund, replacement or exchange less delivery charges. All returns must have an RA number posted clearly on the outside of the return package or box. Returns are at your own expense and it is your responsibility to obtain proof of posting. If we agree to pay the return cost, this cost must be agreed prior to sending it it to us. Personalised and custom designed products are non-returnable or refundable. In addition, you may cancel your order for any reason within 7 days of ordering. We will accept authorised returns as long as the items are unused and securely wrapped in the original packaging. We will gladly offer you either an exchange or refund (excluding any postage & merchant service fees) providing goods have been returned within 14 days of receipt and arrive back with us in perfect/saleable condition in their original packaging. If an order needs to be returned due to damage during transit, we need to be contacted within 3 business days of receipt of the merchandise to obtain a return authorisation so that we can immediately file a damage claim with the courier. We can offer an exchange for the correct product or a full refund. The Pink Pear is committed to protecting the privacy of our customers and using information responsibly. Please be assured that we respect your privacy and any information we collect form you is used to communicate with you and is never sold or disclosed to outside third parties.